In India recollection of Previous Lives is a common feature in the histories of the saints and heroes of sacred tradition. The doctrine of transmigration, since the later Vedic period, has played such an important part in the history of the national character and religious ideas that even Buddhist literature has included the ages of the past as an authentic background to the founder's historical life as gautama. Jataka stories or birth-legends were widely known in the third century B.C. The pali work, entitled "The Jataka" contains 537 Birth stories of the Buddha's former births. Each story, narrated by the Buddha, opens with a preface relating the particular circumstance s in the Buddha's life, revealing some events in the long series of his precious existences as a bodhisattva. At the end the Buddha identifies the different actors in the story in their present births. These stories magnify the glory of the Buddha and illustrate Buddhist doctrines and precepts by appropriate examples. The foremost interest of these legends lies in their relation to folklore giving a vivid picture of the social life and customs of ancient India. In India recollection of previous lives is a common feature in the histories of the saints and heroes of sacred tradition. The doctrine of transmigration, since the later Vedic period, has played such an important part in the history of the national character and religious ideas that even Buddhist literature has included the ages of the past as an authentic background to the founder's historical life as Gautama. Jataka stories or birth legends were widely known in the third century B.C. The Pali work, entitled "The Jataka" contains 537 Birth-stories of the Buddha's former births. Each story, narrated by the Buddha, opens with a preface relating the particular circumstances in the Buddha's life, revealing some events in the long series of his previous existences as a bodhisattva. At the end the Buddha identifies the different actors in the story in their present births. These stories magnify the glory of the Buddha and illustrate Buddhist doctrines and precepts by appropriate examples. The foremost interest of these legends lies in their relation to folklore giving a vivid picture of the social life and customs of ancient India. 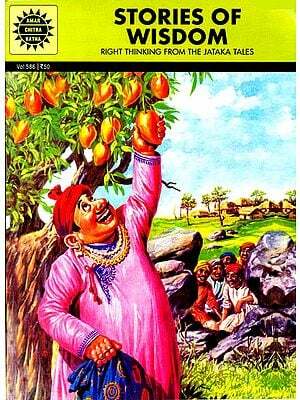 The famous translations of the Jataka Stories from Pali edited by Prof.E.B. Cowell are now once again being made available to the general public in three volumes. IT was an almost isolated incident in Greek literary history I, when Pythagoras claimed to remember his previous lives •. Consequently he remembered the Trojan war, where, as Euphorbus, he was wounded by Menelaus, and, as Pythagoras, he could still recognise the shield which Menelaus had hung up in the temple of Apollo at Branchidae ; and similarly he remembered his subsequent birth as Hermotimus, and then as Pyrrhus, a fisherman of Delos. But in India this recollection of previous lives is a common feature in the histories of the saints and heroes of sacred tradition; and it is especially mentioned by Manu' as the effect of a self-denying and pious life. The doctrine of Metempsychosis, since the later Vedic period, has played such an important part in the history of the national character and religious ideas that we need not be surprised to find that Buddhist literature from the earliest times (although giving a theory of its own to explain the transmigration) has always included the ages of the past as an authentic background to the founder's historical life as Gautama. Jataka legends occur even in the Canonical Pitakas ; thus the Sukha-vihari Jataka and the 'I'ittira Jataka, which are respectively the lOth and the 37th in this volume, are found in the Culla Vagga, vii. 1 and vi. 6, and similarly the Khandhavatta Jataka, which will be given in the next volume, is found in the Culla Vagga v. 6; and there are several other examples. So too one of the minor books of the Sutta Pitaka (the Cariya Pitaka) consists of 35 Jatakas told in verse; and ten at least 1 But compare the account of Aristeas of Proconnesus in Hdt. iv. 14, 15. , Diogenes Laert. viii. 1. a iv. 148. of these can be identified in the volumes of our present collection already published; and probably several of the others will be traced when it is all printed. The Sutta and Vinaya Pi takas are generally accepted as at least older than the Council of Vesali (380 B.C. ? ); and thus Jataka legends must have been always recognised in Buddhist literature. This conclusion is confirmed by the fact that Jataka scenes are found sculptured in the carvings on the railings round the relic shrines of Sanchi and Amaravati and especially those of Bharhut-, where the titles of several Jatakas are clearly inscribed over some of the carvings. These bas-reliefs prove that the birth- legends were widely known in the third century B.C. and were then considered as part of the sacred history of the religion. Fah-hian, when he visited Ceylon, (400 A.D.), saw at Abhayagiri "representa- tions of the 500 bodily forms which the Bodhisatta assumed during his successive births'," and he particularly mentions his births as Sou-ta-nou, a bright flash of light, the king of the elephants, and an antelope 3. These legends were also continually introduced into the religious discourses' which were delivered by the various teachers in the course of their wanderings, whether to magnify the glory of the Buddha or to illustrate Buddhist doctrines and precepts by appropriate examples, somewhat in the same way as mediaeval preachers in Europe used to enliven their sermons by introducing fables and popular tales to rouse the flagging attention of their hearers". It is quite uncertain when these various birth-stories were put together in a systematic form such as we find in our present Jataka collection. At first they were probably handed down orally, but their growing popularity would ensure that their kernel, at any rate, would ere long be committed to some more permanent form. In fact there is a singular parallel to this in the' Gesta Romanorum " which was compiled by an uncertain author in the 14th century and contains nearly 200 fables and stories told to illustrate various virtues and vices, many of them winding up with a religious application. , One of these is given as the frontispiece to this volume, see No. 46. " Beal's transl. p. 157. • Hiouen-thsang twice refers to Jatakas, Julien, i. l37, 197. , See Prof. M. M. Kunt/e's paper, Journ. R. A. S. Ceylon, viii. 123. • In the curious description of the Buddhist grove in the Harsha-carita, viii., Bana mentions owls "which repeated the Bodhisattva's Jiitakas, having gained illumination by continually hearing them recited." 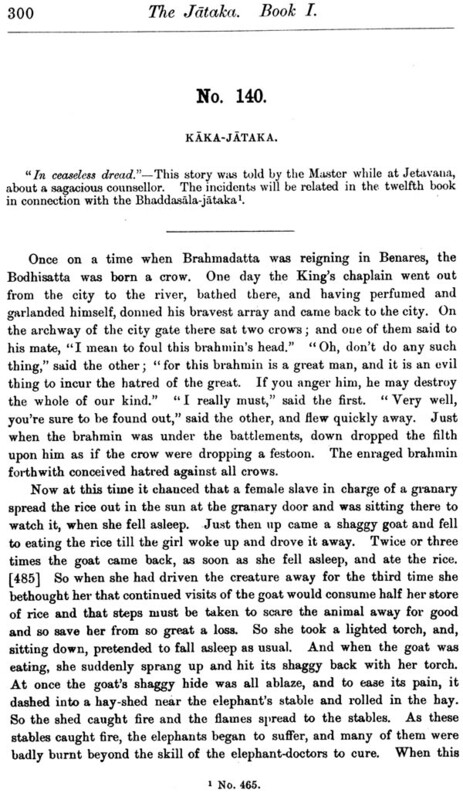 Some of the birth-stories are evidently Buddhistic and entirely depend for their point on some custom or idea peculiar to Buddhism; but many are pieces of folk-lore which have floated about the world for ages as the stray waifs of literature and are liable everywhere to be appropriated by any casual claimant. The same stories may thus, in the course of their long wanderings, come to be recognised under widely different aspects, as when they are used by Boccaccio or Poggio merely as merry tales, or by some Welsh bard to embellish king Arthur's legendary glories, or by some Buddhist samana or mediaeval friar to. add point to his discourse. Chaucer unwittingly puts a Jataka story into the mouth of his Pardonere when he tells his tale of ‘ the ryotoures three'; and another appears in Herodotus as the popular explanation of the sudden rise of the Alcmaeonidae through Megacles' marriage with Cleisthenes' daughter and the rejection of his rival Hippocleides. The Pali work, entitled' the Jataka '; the first volume of which is now presented to the reader in an English form, contains 550 .Tatakas or Birth-stories, which are arranged in 22 nipatas or books. This division roughly founded on the number of verses (gathas) which are quoted in each story; thus the first book contains 150 stories, each of which only quotes one verse, the second 100, each of which quotes two, the third and fourth 50 each, which respectively quote 3 and 4, and so on to the twenty-first with 5 stories, each of which quotes 80 verses, and the twenty-second with 10 stories, each quoting a still larger number. Each story opens with a preface called the paccuppannavatthu or ' story of the present', which relates the particular circumstances in the Buddha's life which led him to tell the birth-story and thus reveal some event in the lung series of his previous existences as a bodhisatta or a being destined to attain Buddha-ship. At the end there is always given a short summary, where the Buddha identifies the different actors in the story in their present births at the time of his discourse,-it being an essential condition of the book that the Buddha possesses the same power as that which Pythagoras claimed but with a far more extensive range, since he could remember all the past events in every being's previous existences as well as in his own. Every story is also illustrated by one or more gathas which are uttered by the Buddha while still a Bodhisatta and so playing his part in the narrative; but sometimes the verses are put into his mouth as the Buddha, when they are called abhisambuddha-gatha. Some of these stanzas are found in the canonical book called the Dhammapada ; and many of the Jataka stories are given in the old Commentary on that -book but with varying details, and sometimes associated with verses which are not given in our present Jataka text. This might seem to imply that there is not necessarily a strict connexion between any particular story and the verses which may be quoted as its moral; but in most cases an apposite stanza would of course soon assert a prescriptive right to any narrative which it seemed specially to illustrate. The language of the gathas is much more archaic than that of the stories; and it certainly seems more probable to suppose that they are the older kernel of the work, and that thus in its original form the Jataka, like the Cariya-pitaka, consisted only of these verses. It is quite true that they are generally unintelligible without the story, but such is continually the case with proverbial sayings; the traditional commentary passes by word of mouth in a varying form along with the adage, as in the well-known our own' Hobson's choice', until some author writes it down in a crystallised form'. Occasionally the same birth-story is repeated elsewhere in a somewhat varied form and with different verses attached to it; and we sometimes find the phrase iti vittharetabbam, which seems to imply that the narrator is to amplify the details at his discretion. The native tradition in Ceylon is that the original Jataka Book consisted of the gathas alone, and that a commentary on these, containing the stories which they were intended to illustrate, was written in very early times in Singhalese. 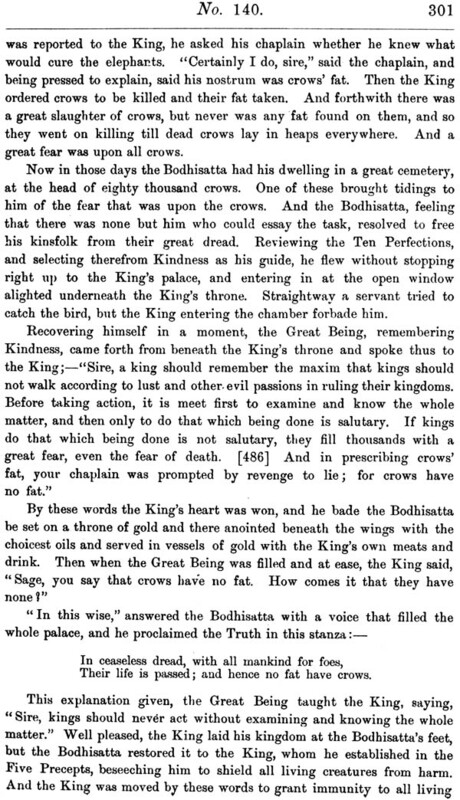 This was translated into Pali about 430 A.D. by Buddhaghosa, who translated so many of the early Singhalese commentaries into Pali ; and after this the Singhalese original was lost. The accuracy of this tradition has been discussed by Professor Rhys Davids in the Introduction to the first volume of his 'Buddhist Birth Stories' 3; and we may safely adopt his conclusion, that if the prose commentary was not composed by Buddhaghosa, it was composed not long after- wards; and as in any case it was merely a redaction of materials 1 We have an interesting illustration of the proverbial character of some of the Jataka stories in the Sankhya Aphorisms, iv. 11, “ he who is without hope is happy like Pingala," which finds its explanation in Jat. 330. It is also referred to in the Mababh. xii, 6520. • As e.g. Fausboll, iii. p. 495. Cf. Divyavad. p. 377, l. 3 See also several papers in the eighth volume of the Journal of the Ceylon Branch. of the r. A. Society. handed down from very early times in the Buddhist community, it is not a question of much importance except for Pali literary history. The gathas are undoubtedly old, and they necessarily imply the previous existence of the stories, though not perhaps in the exact words in which we now possess them. The Jatakas are preceded in the Pali text by a long Introduction, the Nidana-katha, which gives the Buddha's previous history both before his last birth, and also during his last existence until he attained the state of a Buddha '. This has been translated by Professor Rhys Davids, but as it has no direct connexion with the rest of the work, we have omitted it in our translation, which commences with the first Birth-story. We have translated the quasi-historical introductions which always precede the different birth-stories, as they are an essential part of the plan of the original work.since they link each tale with some special incident in the Buddha's life, which tradition venerates as the occasion when he is supposed to have recalled the forgotten scene of a long past existence to his contemporaries. But it is an interesting question for future investigation how far they contain any historical data. They appear at first sight to harmonise with the framework of the Pitakas ; but I confess that I have no confidence in their historical credibility,-they seem to me rather the laboured invention of a later age, like the legendary history of the early centuries of ancient Rome. But this question will be more easily settled, when we have made further progress in the translation. The Jatakas themselves are of course interesting as specimens of Buddhist literature; but their foremost interest to us consists in their relation to folk-lore and the light which they often throw on those popular stories which illustrate so vividly the ideas and superstitions of the early times of civilisation. in this respect they possess a special value, as, although much of their matter is peculiar to Buddhism, they contain embedded with it an unrivalled collection of Folk-lore. They are also full of interest as giving a vivid picture of the social life and customs of ancient India. Such books as Lieutenant-Colonel Sleeman's 'Rambles' or Mr Grierson's 'Bihar Peasant Life' illustrate them at every turn, They form in fact an ever-shifting panorama of the village life such as Fah-hian and Hiouen-thsang saw it in the old days before the Muhammadan 1 This la.tter portion partly corresponds to the well-known Lalita-vistara of the Northern Buddhists. conquest, when Hindu institutions and native rille prevailed in every province throughout the land. Like all collections of early popular tales they are full of violence and craft, and betray a low opinion of woman; but outbursts of nobler feeling are not wanting, to relieve the darker colours. Professor Rhys Davids first commenced a translation of the Jataka in 1880, but other engagements obliged him to discontinue it after one volume had appeared, containing the Nidanakatha and 40 stories. The present translation has been undertaken by a band of friends who hope, by each being responsible for a definite portion, to complete the whole within a reasonable time. We are in fact a guild of Jataka translators, creshthi-purva vayam crenih; but, although we have adopted some common principles of translation and aim at a certain general uniformity in our technical terms and in transliteration, we have agreed to leave each individual translator, within certain limits, a free hand in his own work., The Editor only exercises a general superintendence, in consultation with the two resident translators, Mr Francis and Mr Neil. The Bodhisatta is a young lion, one of seven brothers; a jackal propose love to his sister. Six of the brothers set out to kill the jackal, but seeing him as he lies in a crystal grotto, imagine him to be in the sky, leap up and kill themselves. The Bodhisatta roars, and the jackal dies of fear. A Garula chases a serpent, which taking the form of a jewel, fixes himself upon an ascetic's garment, and by this means wins safety. How a man had his horse burnt by reason of the great offerings which he made to his sacred fire. I want to read ins and outs this text. this is because we are in third world country alias Myanmar.We can't affort to buy or read your excellency text.